Today's Makeover Monday post is about our spare/guest bedroom, this was probably the simplest room to transform in the house just needing repainting, re carpeting and some prettying up! But it's now one of my favourite rooms in the house, probably because it's the girliest and the morning sun lights streams though everyday. 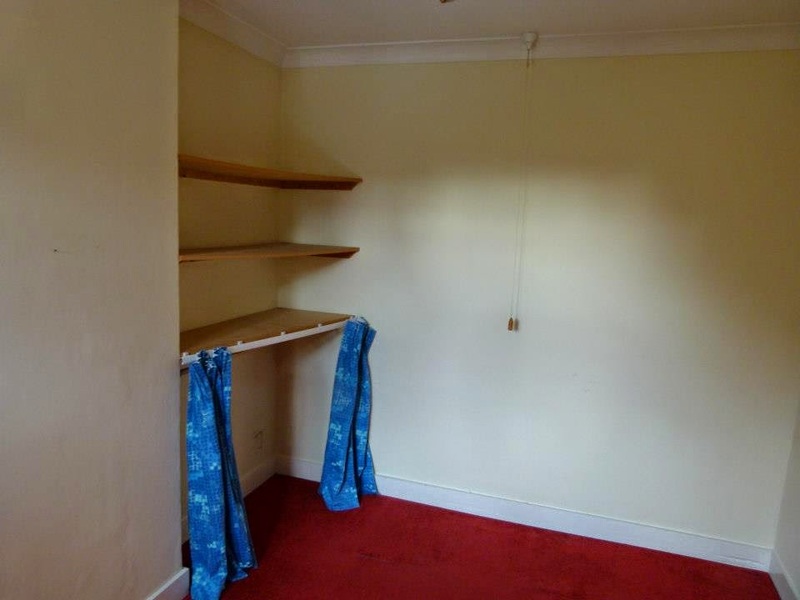 It didn't take long for us to rip out the shelves and curtains and start repainting the ceiling and walls in this room. We also wanted the pull cord for the light removed and then put new carpets down. This room was to be dedicated to my love and collection of vintage collectables I've bought over the years from various antique shops and markets. 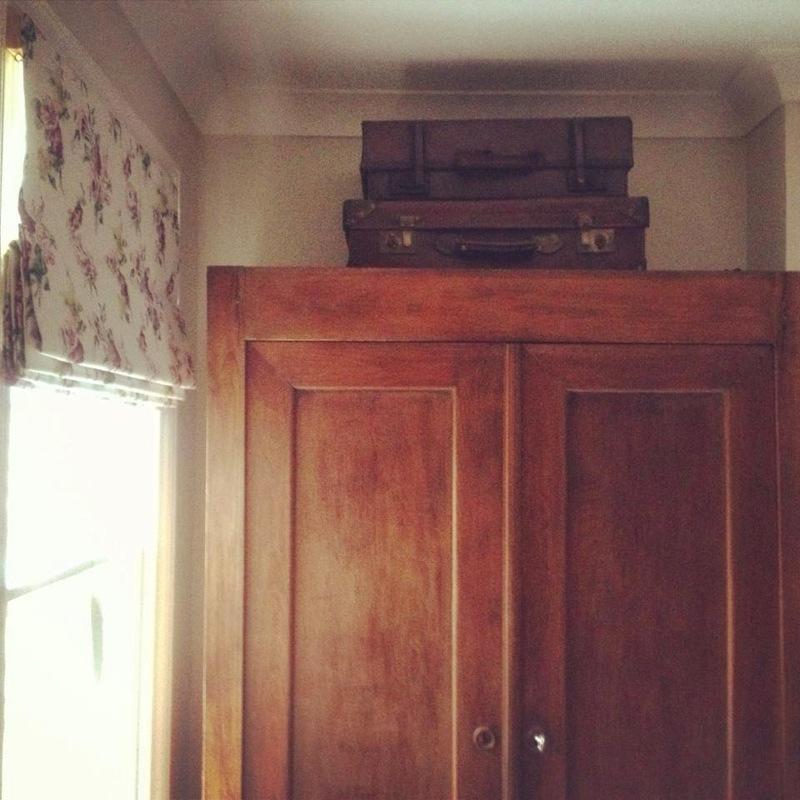 I've always loved old suitcases and stacked them up as a bedside table and then bought some more which now live on top of the wardrobe. 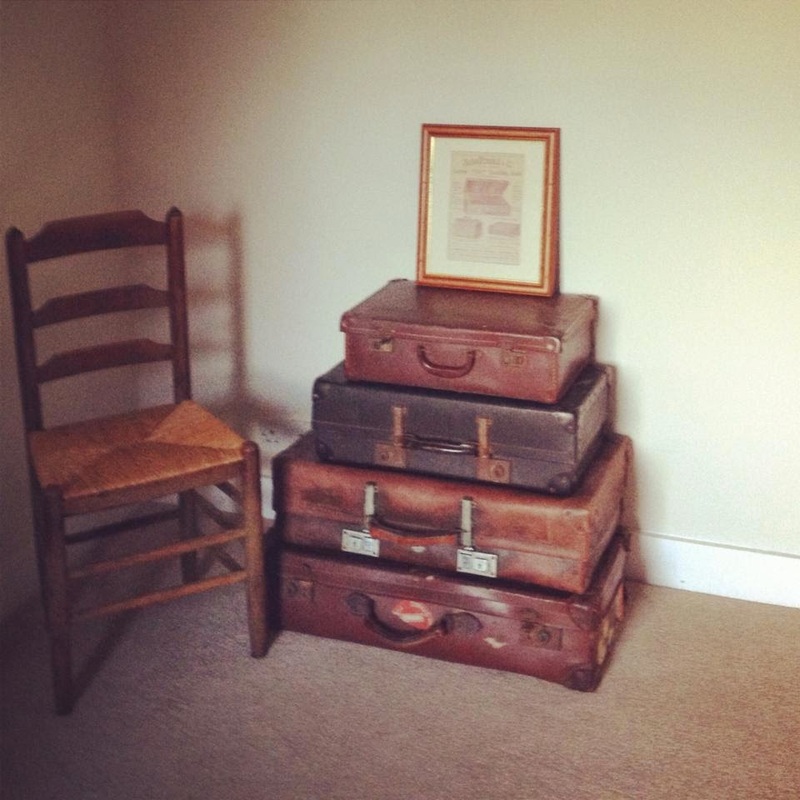 The print sitting on top of them is from a car boot sale, it's an advert for old leather luggage which I thought was fitting for the room. 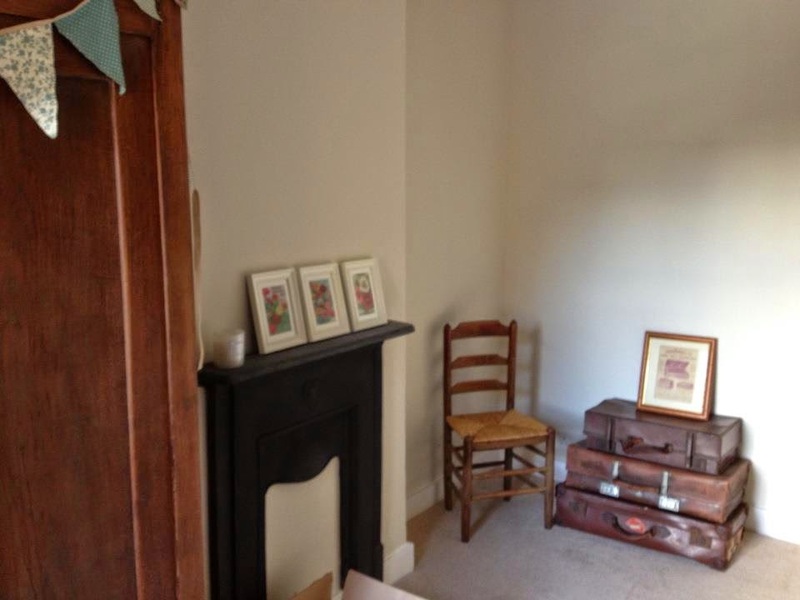 Ben fitted a fireplace on the chimney breast to give some character and interest and I framed a set of vintage seed packet postcards which can be found online here in Ikea frames. They're so pretty and sometimes I prefer to just balance frames rather than putting everything up on the wall. In addition to suitcases, I love old little chairs and thought this sweet one, purchased from a junk shop near my Auntie in the Peak District would sit nicely in the room. The wardrobe is a vintage French armoire that we bought on eBay from a man in Kent who imports lots of French furniture he buys from flea markets across the channel. I like the dark wood against the light cream walls and it's Ben's only space for his clothes after I common-eared all the space in our bedroom. The bunting was only there while I decided what to do with it, unfortunately it got in the way when Ben was opening it up each day. Note the old original sash window which we had to replace, the weights were broken and it was only single glazed so freezing in the winter. I had a blind made by a family friend in Ikea's Emmy Ros fabric, a pretty floral pattern. We bought an ottoman bed which lifts up and has deep storage underneath. I dressed it with a lace duvet set from Homebase can you believe, and had cushions made in the same fabric as the blinds. The smaller heart cushion is by East of India which was a present. 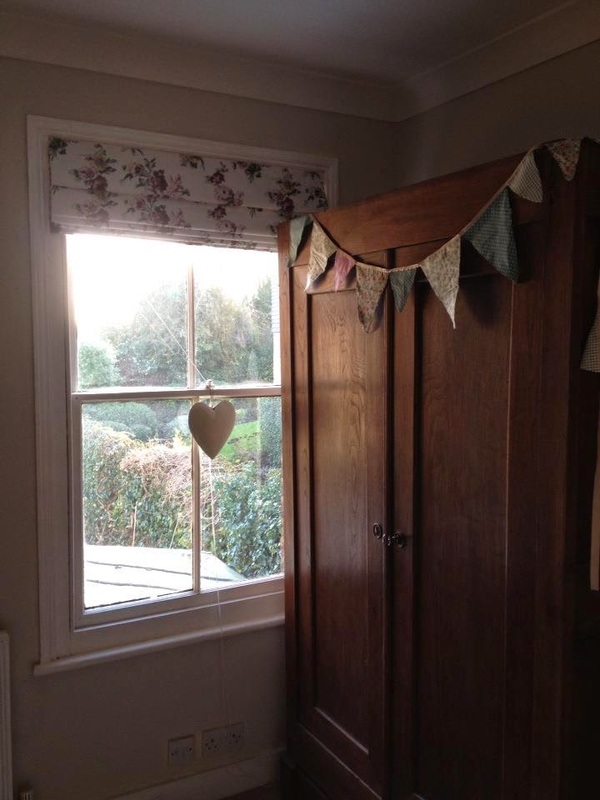 We had the window replaced for a wooden top-opening, sash style when we had our building work done last year. It's a lot warmer now and we had a window sill installed. Luckily the opening size stayed the same so the blind still fits. The chest of drawers are a fairly recent addition, they've been in Ben's family for years but were being used in my Dad's garage as a tool kit! I pinched them back from him as we needed some more storage and they fitted perfectly in the alcove. So the suitcases moved to the base of the bed instead and the print got hung on the wall. I kept one smaller suitcase on top of the chest of drawers and added a lamp, a stoneware jar and some magazines for guests to look through. An old St Ives travel print sits on top, we bought it after we got engaged and were staying in St Ives in 2012. It adds to the vintage travel theme. This mirror hangs on the wall as you go in to the room and it cost me the grand total of £2 at a car boot sale! I love the vintage frameless style of it. Thanks for showing us these images & tips for bedroom makeover.